This new MICROFLOW design is the result of decades of fuel system processing experience on large scale automated systems. The new MICROFLOW 100 brings the same precise processing of a fully automated targeting system, now packed into a smaller package as a stand alone machine. Designed for small holes and features requiring a specifi c fl ow rate, this stand alone production unit is capable of delivering precision results. The small-scale robust design is scalable to your production requirements and delivers a combination of high precision, reliability, accuracy, and ease of use. Remote service tracking and standardized components offer production stability. 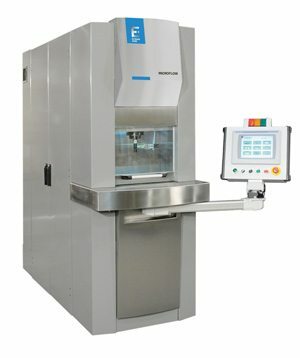 The new MICROFLOW works as a lab machine or a production workhorse. New enclosure design is only 750mm wide x 2030mm deep. Intuitive controls and HMI – easy media changeover.